I was seventeen, and alone, crying uncontrollably in the corridor. And I went to my French lesson anyway. It was the end of form period and the bell had just rung for the final lesson of the day. “Tanya, could you stay behind for a moment?” my form tutor asked. I nodded, surprised. I rarely spoke to my form tutor. I was at a girls’ grammar school. Most of the students there were taking three A levels, as was normal; I was taking four. I had just finished my application for the top university in the country. This meant that my life consisted of me avoiding the flute and piano practice I was supposed to do, running from church meeting to orchestra, to school, to meeting my boyfriend, and then doing homework in the small corners in-between. At the time that my form tutor had asked to speak to me, I was surreptitiously doing French vocabulary homework. This is how I fitted it all in; I was outlandishly lazy at some points, watching soap operas and procrastinating, and then squeezing out tiny fragments of time to the last drop, like I was wringing a flannel dry. French and Spanish homework was always done in lunch breaks and registration, Chaucer translation in the time that I was waiting to be collected from school. I was utterly focused on getting those four A grades and getting to the university of my choice. I just had to. I was holding it together, but I was under a great deal of pressure. And that week, my Mum had gone into hospital. We didn’t know what was wrong (it turned out to be fairly minor and treatable) but she was in a lot of pain – and she was scared. Mums aren’t supposed to be scared or in hospital, and I was walking through my days with the precarious steps of someone who knew the ice could give way at any minute. As it turned out, all it took was one question. 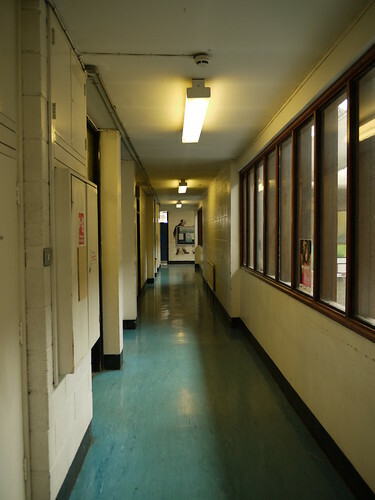 When all the rest of my form group had gone, it was just me and the form tutor who remained in the corridor. I burst into tears. It was just that one question, it tipped me over the edge. I couldn’t even explain why. The pressure had got too great and I had cracked under questioning. Immediately, my teacher looked uncomfortable. She hadn’t expected my reaction, and wasn’t really sure what to do with it. I nodded yes, because there wasn’t much else I could do. I went, sobbing, to my French lesson. Why? Because I had to. I couldn’t not. I had four A Levels to do and a university place to win and four A grades to get. I arrived late and hoped I wouldn’t get into trouble. I thought that the French would act as a distraction, but the tears kept spilling out sideways. I couldn’t stop them. My French teacher, Mrs West – blessings upon her! – asked every single other person in the class to answer questions in French, and didn’t ask me a single thing. I later discovered that she asked my friend to stay behind so that she could talk to her about me. “It’s the pressure,” Mrs West told her. “This school… the pace of work…” She shook her head, and made my friend promise to look after me. She never said anything directly to me. Then two weeks later I shared a drink with my sister, who had glandular fever (mononucleosis). My already stress-depleted immune system was knocked to the ground. My body had no resources left to fight the virus. I was off school, exhausted and flu-like, for two months. What is the day that changed your life? Most people with M.E can name the day they went from healthy to ill. They caught a virus and never recovered. For me, the onset was much more insidious. It was triggered by the glandular fever and began as mild but was made worse by bad medical advice and my own stubborn determination to not give up what I held dear. If you had told my seventeen-year-old self, ‘you need to rest and take a year out – this virus has the potential to seriously affect your health for decades afterwards if you don’t allow your body to properly recover now’ – I would probably not have done anything differently. I was so utterly focused on my goals, and so determined to be the best – it was all that mattered to me. I would have gladly sacrificed my future health (who cares about health when you’re OLD?) for the goal of getting into Cambridge. I had the foolish single-mindedness and misplaced idealism of a teenager because, after all, that is what I was. That day, the day where I was crying in the corridor, could have changed my life. I could have taken stock, stepped back, adjusted my pace, dropped my workload, admitted that I didn’t have to achieve all that I wanted to, that it didn’t matter that much. But I didn’t let it change my life, so the day I unsuspectingly drank from the same cup as my sister was the day that changed my life instead. Novelists call these kinds of days ‘inciting incidents’: the pivotal moments, the forks in the road where the character makes an important decision which changes the course of their life. If I were a character in a story, I would have instantly learnt my lesson. Unfortunately, I’m a good deal more stubborn. I have learnt, through long, painful lessons, that I need to let go, and that I need to surrender goals and my instinct to perfectionism. I leave things half-done and undone, and I have made my peace with that. (Mostly). I have learnt that I don’t need to compete with Jesus to be my own messiah, and that there is strength in being weak, because that is where grace is found. In 2012, in my early thirties, I am better at dealing with the truth that I am not superwoman. I am better at accepting my limitations, and not pushing my body beyond its limits. I think back to the insistence and desperation that I held to my A Levels and I know that I am not that person anymore. Today, I am feeling that tension between the old me and the new me. I am staring down the barrel of a busy (for me) September. I have guest posts that I have pre-written and guest-posters that I have invited – and there are new things happening in church. (It’s exciting!) But my health has slipped a little in the last week and I have spent the past three days in bed. I know, the 2012-me knows, that I need to start looking at my life and seeing what I should cut. But there are still times, even today, when the seventeen-year-old in me pops up and cries in the corridor and goes to the French lesson anyway. I don’t know about you, but I find that rather than having one life-altering and character-changing day, I repeatedly go through what feels like exactly the same thing, learning the same lesson over and over. We usually think of change as a u-turn, a reversal. But change, particularly character change, is not a u-turn but a spiral. It feels like you’re going in circles but you’re slowly getting closer to the target. Sometimes holiness comes in a big whooshing breakthrough, a decisive victory. For me, it is one day after another, one foot in front of the other; a gradual, faltering stumbling towards wholeness and the One who makes all things new. This blog was inspired by a new book: Inciting Incidents. Inciting Incidents combines the unique stories from six creatives (artists, musicians, writers, thinkers, and leaders) managing the tensions between their faith, their place in life, and their work as artists. It is a collective call to face life’s imperfections and difficulties while attempting to do the great things we all want to do. An inciting incident is one where a character is put under pressure or makes a discovery and has an ‘aha’ moment and changes their course as a result. Can you think of incidents like that in your life? Have you had one day that changed your life and character, or has it been a more subtle journey? Linking with Life Unmasked at Joy in this Journey, WIP Weds and Imperfect Prose with Emily. I love this kind of blog post. It is not only engaging (and heartbreaking!) as a story, but it also inspires me to think about my own “inciting incidents.” What a great prompt for writing! And yes – it was a great prompt – I’m really grateful for it. It is so true that eventually (looking back – maybe years later) that the hardest times are when we grow the most. One of my defining moments was after teaching some years, an advisor told me I was a failure at my job. I was completely devistated at the time but now, almost 15 years later, I can see how I changed…I discovered how to rely on God’s assessment of me, not man’s (If you ever get the chance to study ‘Search for Significance’ by Robert McGee – it is amazing!) and it kick started me searching out what gifts God had given me and what I could be good at – in His strength not mine. I now teach children with autism and teach and advise other teachers how to support children with autism. I love it. I wonder if I’ll ever get the chance to thank that advisor????? Welcome to the blog! It’s lovely to see you here. I would have been devastated to get the feedback you did – but man, what a great calling to teach kids with autism – that sounds so cool! Do check out my friend Alice’s (she commented above) blog too, Play on the word – she thinks a lot about these kinds of things, and loves thinking creatively about how to teach the Bible. I know Alice we go to the same church! She recommended you! Ha! How funny! I love that! When I was 24 and had been married for a year I worked at a school where a virus swept through the staff. Five members of staff (me included) didn’t recover. Environmental Health were called in and did loads of tests on the air quality, paint etc then announced we were just hysterical women. M.E. wasn’t recognised at that time but a friend of one of the staff was a Pathologist who had heard of M.E. That was my first experience of M.E. I was ill for three years but after taking 6 months off and resting I became pregnant and recovered from M.E. I had two sons, worked full time, went to the gym. I even spoke at an M.E. support group to show there is always hope. I thought that was the end of M.E. Sadly four and a half years ago after being extremely stressed at work I was ill with one virus after another. I just thought I was run down and had no idea I could get M.E. again. I keep feel guilty that I didn’t leave that job and maybe get a part time job but I loved the work itself I was good at it so was asked to do more and more. There was a day (the day) when I was really weepy at work and went off sick with stress for three months. I shouldn’t have gone back. Maybe then I wouldn’t be in the position I am in now but hind sight is a wonderful thing. I try to look forward and pray I’ll recover from this second bout even though five Consultants think that’s not going to happen. God is able if he so chooses. He sees the bigger picture and I have to trust him. Ach. Your story, somehow more than mine, makes me long for the day that M.E. is taken seriously by the medical community and that they find a way to treat it. Thanks so much for sharing it. And you’re right – no matter what predictions the doctors make, God can do immeasurably more than we ask or imagine. Thanks for sharing your story Tanya, I really admire you for your courage to do so. I know going thought everything I have, has made me much more understanding and compassionate and for that I’m very grateful. Oh wow – Christmas day – that’s gutting! I’m so glad you had a good GP – and I LOVE the advice of Prof Brostoff – that rocks! I can so much relate to this!!!! For me, it was my 20 year old self in my last year of college. I remember the day that cfs/me hit me. It was profound. And life changed forever. I have recently allowed myself to think, what if I had done things differently. What if I had known. Would I have changed how I handled the stress leading up to the illness? I hope to God that I would. Thanks for the reminder about life today. I too have struggled with what to “cut”. It all seems so important and available. But too much of it and I will sacrifice the little health that I have left. Thank for you for sharing your story and thanks for the reminder! I’m so glad that you can relate! The ‘what if’s are hard, aren’t they? I hesitated with some of the phrasing in this particular post becuase sometimes I think I’m too harsh on myself still – blaming myself when actually there may have been nothing I could do about it. You never know, the illness might have progressed in exactly the same way. But on the other hand, stress will make any illness worse, and I don’t think I did my body any favours. HOpe you’re feeling stronger soon. There’s something bracing and overwhelming about Septembers, huh? I smiled at the thought that God instituted child-rearing to teach us how childish we are! I can certainly relate to that…! My word this is one powerful story. I feel pretty heartbroken for your 17 year old self – but stubbornness is hard to penetrate isn’t it? It’s so true to look back and know that we wouldn’t do things differently because the pressure feels so real and we feel so invincible. Recognising weakness is hard isn’t it? I’m dwelling on your description of competing with Jesus – because grace is just so humbling, right?! I’m always learning the same lessons. Over and again. I’m always more encouraged and strengthened when people share their weakness than when they flaunt their strength. Lovely Alice – I always feel that you get right to the core of what I’m feeling. Yes, I think I also feel kinda heartbroken for my seventeen-year-old self. I was so hard on myself. Thanks for your encouragement to be bold in sharing my weakness – I felt quite a lot of hesitation before pushing publish on this particular one. wow! so powerful!! I know so many can relate to your tension of life and heart. We live in a pressure filled world. Love your story! I love how you are living it out! Thank you so much for being a part of this!